Four countries claim territory in the Antarctic and issue stamps for their territories. They are Australia (Australian Antarctic Territory), Great Britain (British Antarctic Territory), New Zealand (the Ross Dependency), and France (the French Southern and Antarctic Territories). Of these, the French territory, also known as French Antarctic and abbreviated as F.S.A.T. 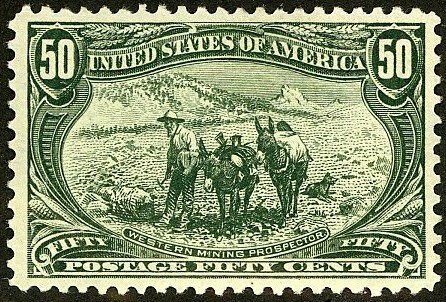 or T.A.A.F., is of most interest to philatelists, because most of the F.S.A.T. stamps have been issued in modest quantities and many are beautifully engraved. Most stamps issued for the various Antarctic territories are sold to collectors, as only a few hundred scientists reside in research facilities in the Antarctic. In 1965, the F.S.A.T. 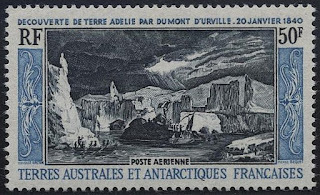 issued an attractive bi-colored stamp celebrating the 125th Anniversary of the Discovery of Adelie Land by the explorer Dumont d'Urville (Scott #C7). 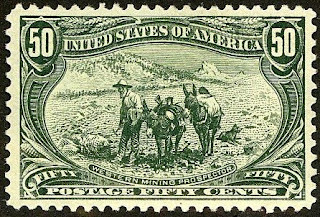 60,000 were issued, and Scott '12 prices the unused stamp at $125.00 . 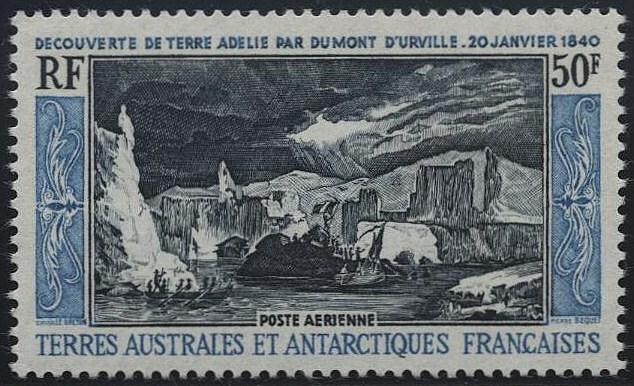 Demand for stamps of the French Antarctic is strong in France, and the Discovery stamp should do well based upon its beauty, historical significance, and appeal to French Colonies and Polar Topical collectors.